Now, even when I'm not actually weighing and measuring my intake, I know how much of each macronutrient I'm putting into my body. It's second nature now. It required only two weeks of strict measuring before I had the clear understanding of exactly what to do to increase athletic performance with the food I was already eating. The realization that I needed to fuel my body differently began on a stationary bike. Spinning away, getting warm for the day's workout, I heard Coach over the drone of the bike, "We can keep working out like this, Robbie, and we'll achieve some results, but it will take us only so far." Iwas intrigued. 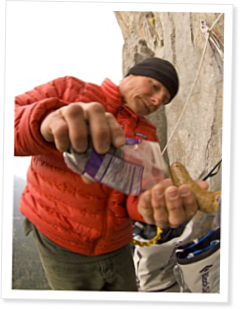 Three weeks earlier I was more debilitated from a twenty-minute workout than I had been from climbing twenty-one hours straight on the two largest cliffs in North America: the Nose route on El Capitan and the Regular Northwest route on Half Dome. As long as I was doing this CrossFit thing I was interested in going all the way, and willing to make the changes required for total success. CrossFit Kids serves up six ways to get your young athletes and their parents thinking about nutrition. Awesome article Rob... I wish I would have read that a long time a go. Thanks for the article. I've heard alot about the Zone and I've been reading alot lately (just picked up The Zone by Dr. Seers tonight) and it's so wild how it's standing all my preconceived/current "education" of nutrition on it's head. My biggest question about this diet is economics. How much more expensive is this diet going to be compared to the food I normally pick up at the grocery store? I do have a budget and I'd like to stay well within and only slightly outside of it, if I have to. Can anyone shed any light on what they might spend weekly on The Zone? Great article! I find it hardest to find enough protein sources to keep with the zone. Love the pizza and beer reward at the end! Well deserved!